I woke up one morning and decided I wanted to change my life. The night before I found a photo of myself. I thought I looked ok, I knew I was overweight, but its only now that I realise just how close I was to making a choice that could have been devastating to my health. I think about what my life could have been like if I had not made the decision to become healthy. Even though I’m only part way through my journey to becoming fit and healthy I am so proud of myself for making the best decision I will ever make. I think about what life was like before, and even the simple things in life were horrible, the clothing choices were limited. People never gave me the time of day. I struggled to walk. Sitting in a chair was nerve racking – what if I didn’t fit or the chair broke. Would anyone ever love me for me looking like that, could anyone ever love me at all looking like that. I look at what I have done this year alone and wish I could help everyone that looks or feels like I use to just to trust themselves and go get healthy. Yes its hard and slow but I’ve had an amazing time too. This year I have met so many amazing, talented, inspiring, motivating, people and done some real life changing things. I have been hit off my bike by a car reversing and damaged my elbow, but I never gave up. I completed Girls on Bikes 4 weeks after that accident. I also signed up for Love New Zealand Challenge which has been harder than I thought but its been really good making sure I try walk even a little each day. It has been one of the best things I have actually done. I really hope that it continues next year. I would love to get on board and help out with it. The 20 Week Challenge was the second most important decision I have made in my life. It gave me a huge insight into my life, I started to see who I really was. People actually started to treat me like an actual person and people wanted to be like me. I’m still struggling with that but I’m loving that I’m able to help. I started walking Sunday mornings with my PT Barb. Doing hills I was almost in tears at the thought of having to even do the walk, then there was the tears of joy after actually walking from the sign of the takahe to the kiwi and realising that I could actually do it and more. Then there was the 8.5 hour walk up mount grey, before something like that would have scared me off and I would never have wanted to be put in that position again. But now I want to do more, its like an addiction. I was so proud of what I achieved in my week 10 of the 20 week challenge, I was injured but I still managed to cycle 50km on the wind trainer, I completed Mud Sweat and tears and so much more. I decided that walking from Princess Margaret Hospital to sugar loaf would be a great thing to do early on a Sunday morning. Then I decided that my training buddies and I needed to take a pole dance class and to try rock climbing. I went on a 5 day walk and Kayak trip in the Able Tasman and loved it. I never would have done anything like that in the past. If you thought this year sounded good you should see what I have in store for next year…2013 for me will be the year that I become me! 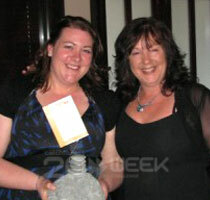 Aimee (left) holding her ‘You Rock Award’ from Diamond Mine. 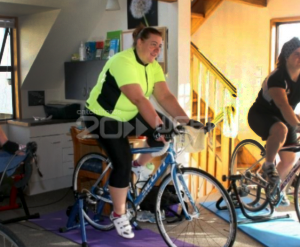 Seen here with her Personal Trainer Barbara Miller. 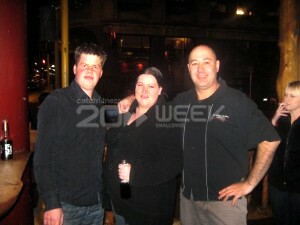 Aimee lost 12 kg during the 20 weeks and will be entering the 2013 competition with the aim of reaching her goal weight.